The Word Casserole originates from France. Its basically the name of the deep pan or vessel used for both baking and serving purpose. There's a lot of varieties in this Casserole dishes - like Chicken Casserole, Meat Casserole, Pasta, Mushrooms, vegetables, Eggs and many more. I was introduced to this dish on our visit to Paris recently. 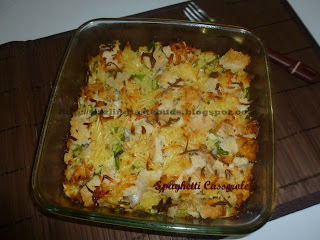 Loved the creamy, cheesy texture of Chicken Casserole we had. This dish is so simple to prepare and tastes heavenly. I had lots of leftovers like bread, vegetables half cut and even SPAGHETTI. Spaghetti packet was untouched for months since I bought them. So I finally used them for yesterday's dinner as I was bored to cook some curry. Ended up the last meal of the day with Sphagetti Casserole. 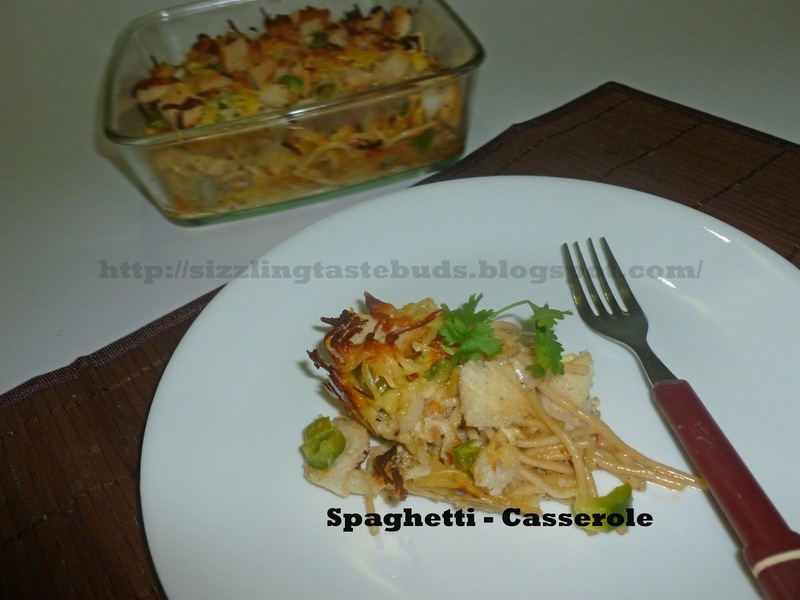 Here's the recipe of Hot, creamy, cheesy Spaghetti Casserole. 1. Cook the spaghetti in water with little salt and 2 tsp oil. Adding oil avoids the noodles to stick together. Once cooked, drain the water and keep aside. 2. Preheat the microwave with 160 C for 10-15 mins. 3. Mean while lets bring everything together. Grease the baking dish with olive oil. 4. Beat 3 eggs with Salt and pepper. 5. Mix this with Spaghetti. Add grated carrot and mix again. Place this as the bottom layer in the greased baking dish. 6. Sprinkle some Italian Seasoning herbs all over this spreaded layer. 7. Place Capsicum, Onion and bread pieces on top of this layer. 8. Finish off with grated cheese as the topmost layer. 9. Bake it for 45 mins at 160 C or till a cheese melts and you get a nice crust on top. Enjoy and have a cheerful day. If you are worried of the cheesy calories intake, please don't forget to exercise the next day. My sister-in-law makes something similar, yours sure looks healthier. Thanks look forward to trying.